Happy New Year Everyone! How were everyone's holidays? I hoped that Santa treated you all very well! As my first nail art of the new year, I bring you ruffle nails. I was just looking at my old posts and I was especially proud of my quilted nails, so I wanted to create another texture nails. Ruffles immediately came to my mind. 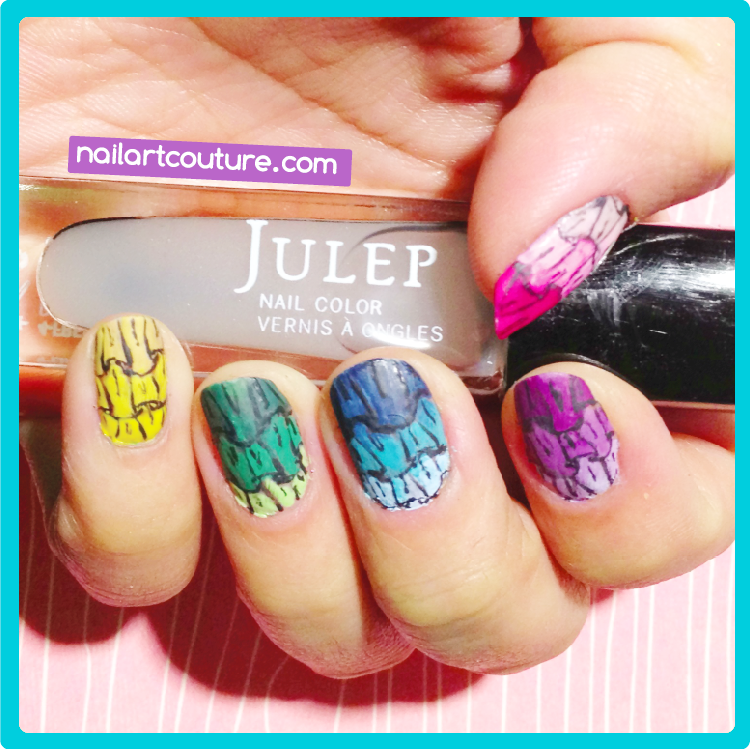 I googled other nail artist's ruffle nail art and realized a lot of them were one dimensional scallop designs. For me, I wanted to be true to the texture and make it look like actual ruffles! I think I succeeded in that aspect. What do you think? I made it a multi-colored ombre nail just because I figured it would look nice. My favorite is the blue nail! 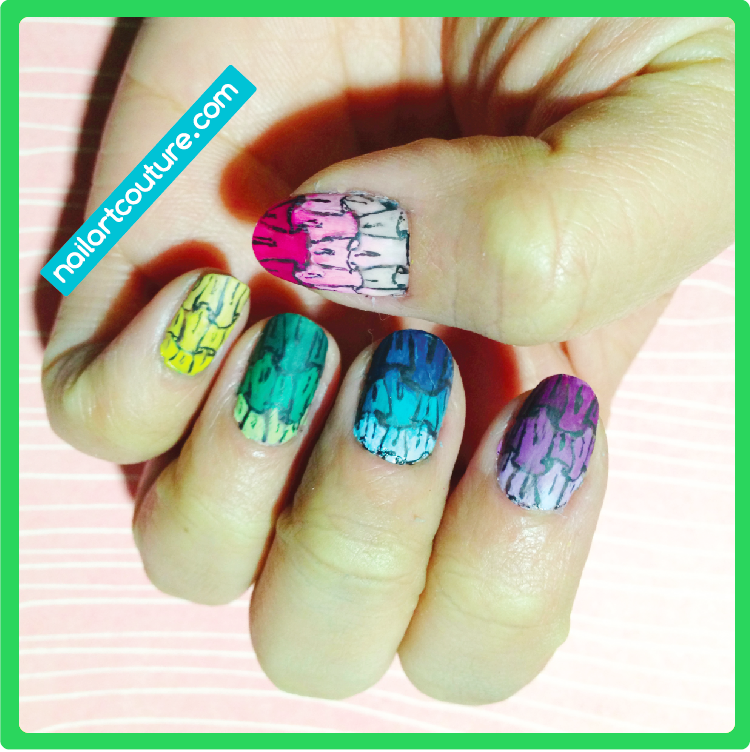 Like most of my nail art in this blog, everything is my first attempt. About 90% of the time, it turns out the way I want it. Thank goodness! Anyways, picture tutorial after the jump. Pink: Julep "Lauren", Julep "Reese", Julep "Kelly"
Purple: Julep "Gayle", Julep "Charlotte", Julep "Renee"
Blue: Julep "Eloise", Julep "Robin", Julep "Jessica"
Green: Julep "Emilie", Julep "Hoch", Julep "Courteney"
Yellow: Julep "Otte", Julep "Alma", Julep "Daisy"
Using the darkest shade, create two spaced out triangles (or as many as you can fit). Allow the base of the triangle to be curved rather than straight. Extend the edges into a small tall, as this will replace the small fold of the fabric. Outline the triangles and create a wide "U" to connect the triangles. Fill in the empty area with the same dark shade. For the advance people, you made want to add some shading. Create lines or a very slim "U" within the ruffles to replicate the slight indent of the ruffle fold. Repeat step 1 to 4 with a slightly lighter shade. Finish your nail art by repeating step 1 to 4 with the lightest shade. As an optional step, add on a matte top coat to eliminate the shine. I hope you enjoy this nail art and tutorial! It does require patience and a steady hand though! If you attempt it, let me know how it turns out!